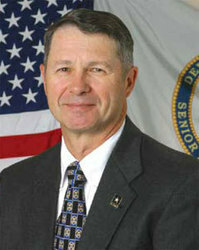 Bob Burkhardt, former U.S. Army Geospatial Center (AGC) Director and the Army's first Geospatial Information Officer (GIO), has been named an industry advisor to TerraGo® Technologies, Inc.
Bob Burkhardt, former U.S. Army Geospatial Center (AGC) Director and the Army’s first Geospatial Information Officer (GIO), has been named an industry advisor to TerraGo® Technologies, Inc.
TerraGo geospatial collaboration software and GeoPDF® play a key role in enabling defense and intelligence agencies to rapidly create, access, update and share portable geospatial intelligence designed for the warfighter and other field/mobile personnel. Burkhardt joins other TerraGo nationally noted geospatial thought leaders including fellow industry advisor and national security expert Darryl Garrett and National Geospatial Advisory Committee member and former Chairman Anne Miglarese, who also serves on the TerraGo Board of Directors. "I'm pleased to continue to be actively involved in the federal geospatial intelligence community through my new role with TerraGo," said Burkhardt, who recently retired after a distinguished 35-year federal and military career. "It's critical that our country maintain its C4ISR advantage in an increasingly dangerous world. The effective delivery and exploitation of geospatial intelligence in the field plays a big role in making sure that happens." "We're extremely proud to team with a widely respected, experienced government executive of Mr. Burkhardt's stature," said Rick Cobb, CEO of TerraGo Technologies. "Without question, Bob will add significant value to TerraGo, helping us to better serve and support our government customers." While leading the AGC, Burkhardt was instrumental in driving the Joint Geospatial Enterprise Services (J-GES) program to promote the use of geospatial technologies to better enable the use of data in a net-centric environment. TerraGo Technologies delivers software applications that extend the access and application of maps and imagery for mobile field professionals who rely on geospatial information to do their jobs. Thousands of global organizations, including many defense and intelligence agencies, petroleum and utility companies, public safety departments, and environmental engineering teams, depend on TerraGo software. The TerraGo Publisher™ Suite allows organizations to consume and optimize data from any source and create GeoPDF® maps and imagery. The TerraGo Collaboration™ Suite offers desktop, Web-based and mobile software applications that automate geospatial collaboration and information gathering and sharing. When used in conjunction with TerraGo Composer™, customers are able to configure easy-to-use 2D and 3D maps, imagery, and digital GeoPDF MapBook products while embedding relevant business context, forms, and workflows. With a strong ecosystem of partners, including Adobe, BAE Systems, ESRI, ERDAS, Hitachi, Intergraph, and Trimble, millions of professionals use geospatial data that has been enabled by TerraGo in order to be more productive, improve quality, and make better decisions. For more information, visit http://www.terragotech.com. TerraGo software creates GeoPDF maps and imagery that conform to the specifications published by the Open Geospatial Consortium as an OGC Best Practice and those published by Adobe as proposed geospatial extensions to ISO 32000. TerraGo and GeoPDF are registered trademarks of TerraGo Technologies, Inc. All other trademarks are the property of their respective owners.